Once you know who your target market is, what the message is you are trying to convey and feel assured that your clients will understand why they should do business with you, it’s time to be creative. Following are some suggestions that will further differentiate you from your competitors. Each will provide an opportunity to distribute your book to clients and prospects. Do you have a client (high-net-worth or institutional) with whom you’ve had a difficult time “getting your foot in the door.” Mail them a copy of your book While a direct mail letter is easy to throw away, NO ONE THROWS AWAY A BOOK. 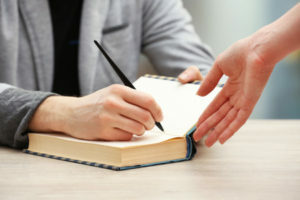 Make sure you include a short note, letting them know you are featured in the book and why, and that you will call to see if there is a time you can meet in a day or two. You might want to include a personalized bookmark in your chapter. QUICK TIP: Include CEOs, CFOs and Human Resource Directors on your mailing list if you are targeting retirement plan business, or corporate exec accounts. It’s time to approach owners of privately owned or local bookstores about a book signing. They are always looking for opportunities to draw customers to their store. Let them know you will only require a commission if a book sells (no up-front purchase required). If they aren’t going to actively advertise the event, you could offer to split the promotional cost with them. QUICK TIP: Don’t just sign books. Let people know you will be available to answer questions about financial issues ­–– and sign books. Or you might offer to do a one-or two-night financial Q&A session in a special area, or private room, of the bookstore for their customers. Get clients to help you with your marketing efforts by either offering them a copy of the book to give to a friend or associate, or by asking whom they think would benefit most from your services, and then personally deliver a copy to them . QUICK TIP: Make sure you include an introductory letter with the book inviting the recipient to call you for a consultation. A seminar is a perfect occasion to distribute your book to clients and prospects. Make sure you do not make the book the main focus. Instead, invite them to a seminar where you and/or another expert can “offer them a solution” to a problem. Don’t just stack the books by the door for people to pick up as they leave. Instead, have someone from your office (not featured in the book) or the event sponsor tell attendees about the book and that you will be available following the event to sign copies. QUICK TIP: Treat the book as a “special” gift you are giving, not a mass production item. At a social event, it’s not nice to “talk shop.” Instead, create a relaxed atmosphere where relationships can be built. Have people from your office promote the book by mentioning it to attendees as they mingle. Make sure they have read your chapter and know enough about the book before they promote it and you. QUICK TIP: Make the book part of a gift pack, which encompasses your event theme. For example, when holding a luau, give each guest a small bottle of suntan lotion, dark glasses, bottled water, granola bar and the book. Wrap all of the items in a beach towel, or put them in customized beach bag. • Calendar of community events – with those you are sponsoring highlighted. • Articles about financial issues they might be facing. • Book reviews for publications you think would benefit your clients. QUICK TIP: Remember to include a review of The Wealth Factor and your chapter (pdf file available upon request for this purpose). If you have not compiled a list of your clients’ email addresses, you should. It’s an excellent tool for sending quick messages and keeping them updated on important industry news. To announce the book, send a “tickler” email that includes some quotes from your book. Then, tell them to let you know if they would like to receive a copy. QUICK TIP: Don’t overdo emails or people will just delete them. Always include a consistent message in the Subject line that identifies you as the sender. Invite your clients to a telephone seminar on a particular topic. Make sure you give them plenty of notice and that, because of limited space, an RSVP is required. A follow-up reminder the day of the seminar is helpful. QUICK TIP: To encourage timely attendance, offer a copy of your book to the first five to join the session. c. A copy of your book with your chapter bookmarked. e. A demo tape (audio or video) showing your presentation skills. f. List of companies or organizations for which you have spoken in the past and a couple of references they can call. QUICK TIP: If they invite you to participate, be prepared. If you do a good job, this could open additional opportunities. If you do poorly, you won’t be given a second chance. Don’t forget: Mark your chapter for easy access. Be creative with the bookmarks. Invite media members to cover your events and treat them as well as you do your other guests. Hold a brainstorming session with your team, friends or family to think of unique ways to get your message out there. BE CREATIVE. Include information about the book when you create your new marketing brochure. Also, include reprints of any media coverage you receive from the book in your marketing packet. This entry was posted in Blogs, Book Publishing, Marketing, Publishing and tagged author, book signing, published, referrals, seminars, webiste marketing. Bookmark the permalink.